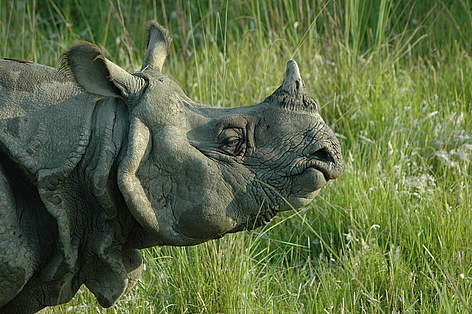 Chitwan National Park is home to the second largest population of greater one horned rhinoceros. The greater one-horned rhinoceros (Rhinoceros unicornis), also known as the Indian rhinoceros, is a grey giant, second only to an elephant in size. An adult rhino usually weighs between 2-2.5 metric tonnes. Rhinos usually lead a solitary life, but they may also graze and wallow together. Calves follow their mothers for 1-3 years. Females are sexually mature between 5 and 7 years old, while males mature at about 10 years of age. The greater one-horned rhinoceros is commonly found only in South Asia and South East Asia. Historically, the rhinos were distributed in the floodplain and forest tracts in Brahmaputra, Ganges and Indus river valley. Today, however, no more than 2,000 remain in the wild, with only two populations containing more than 100 rhinos: Kaziranga National Park in Assam, India (1,200) and Chitwan National Park (CNP), Nepal (600). Despite joint efforts between Bhutan and India, the survival of a small population of rhinos living along the Indo-Bhutan border in Manas still remains doubtful (Jnawali et.at, 2000). After the collapse of the Rana regime in 1950 and the eradication of malaria during the mid-1950s, Chitwan opened to outsiders. Thousands of people cam down from the mid-hills and large swathes of wildlife habitat was cleared for human settlements, agriculture and other development activities. This not only destroyed the forest but also affected the wildlife population because of poaching. This affected mainly large mammals including rhinos and as a result, the rhino population dropped to less than 100 during the late 1960s (Adhikari et. al, 1999). Recognizing the need to halt the decline of rapidly diminishing rhino population, Government of Nepal established the " Gainda Gasti ", an armed Rhino Patrol Unit in 1961, and declared the remaining prime rhino habitats, about 544 sq km along Rapti, Narayani and Reu rivers, as the Chitwan National Park (CNP) in 1973. The park was later extended to encompass a total area of 932 sq km and was listed as a World Heritage Site in 1984 for its high biological diversity. After the successful effort of the Department of National Parks and Wildlife Conservation (DNPWC), the declining rhino population began to gradually increase. The CNP demonstrated that the population can rebound vigorously when sufficient habitat and protection are provided. It is an example of a population that was almost on the verge of extinction that has recovered while still maintaining a high genetic diversity. Rhinos inhabit the alluvial flood-plain vegetation of sub-tropical climates where water and green grass is available all year. Many rhinos now live within blocks of the suitable rhino habitat in CNP. Rhinos occurred in highest densities along the flood plain grasslands and riverine forests bordering the Rapti, Narayani, Reu, and Dhungre rivers, suggesting that floodplain grasslands dominated by 4-6 m tall Saccharum spontanium are the single most critical habitat (Dinerstein and Price, 1991). Grasslands interspersed with patches of riverine forests together make about 30% of the park area and have Saccharum spp., Narenga spp., and Themeda spp . (Shrestha, 1995). This grass species is the fundamental food resource of rhinos comprising more than 60% of the animal diet. Due to the flood and vegetation succession, the grassland may have decreased. Sal Shorea robusta forest associated with species such as Dillennia pentagyna, Syzigium cumini, Trijuga oleofera, Lagerstromia parviflora, Terminalia tomentosa, T. bellerica, and Phyllanthus emblica comprise 70% of the park area and are seldom eaten by rhinos. Inundation by regular flooding of the alluvial plains along major rivers creates conditions favorable for the quick appearance of sprouts and germination to maintain the dominance of Saccharum spontaneum . This makes the monsoon flood very critical for maintaining rhino habitat. Oxbow lakes and other open water bodies are also important because the rhino spends about 8 hours in a day in wallows or streams during high humidity periods (August-September). In December and January, they spend at least an average of a day wallowing (Laurie, 1978).